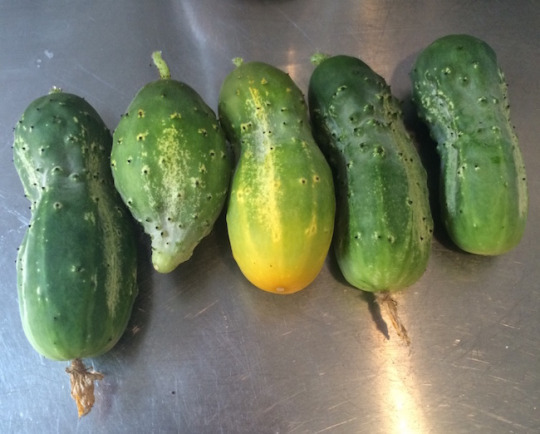 This image comes from Tumblr, not my own camera, but that stubby little cucumber second from the left is pretty much exactly what mine were looking like. I didn’t get any good pictures. We finally gave up on the cucumbers this week. They had not been doing particularly well all season, but with the increased heat and the continued dry weather, the potential return on investment dropped to negative. We saw several different problems with the plants but have been unable to identify if one thing in particular was the cause of the problem or if it was simply the combination of all these stressors which led to their demise. The first symptom we noticed was a yellowing and eventual necrosis of the leaves. This process began with the oldest leaves first, and worked its way up the vines. Concerned that this could indicate a spreading fungal or bacterial disease as witnessed on the tomato plants, I removed all yellowed leaves. This left the plant with comparatively little leaf cover. The leaf removal also had to continue as this did not stop additional leaves from being effected. Additionally, several of the plants dried up and died much more quickly, and the base of their vines appeared to have rotted. The material of the vine would be soggy and riddled with holes, not the fibrous and strong material of a healthy plant. When pulled, these root systems would rip apart rather than come whole out of the earth. As other plants were removed, their root systems did pull up out of the earth, but were riddled with root knots, clearly showing that the nematodes were still at work within the bed. This may explain the continued wilty nature of the bed overall, and my apparent inability to sufficiently water the plants. The fruits themselves showed several signs of disease. Early on in their life cycle they did actually put on what appeared to be healthy fruit, which would fatten up nicely. They matured very quickly, however, without filling in at the end, leaving fat and pointy vegetables. I have found a few different explanations of why this might happen. Some say that this could be a sign of nitrogen deficiency in the soil, but I recently found an article at Horticulture Talk which really resonates with me about general temperature and moisture in the air and how it effects pollination. Apparently you can get deformed fruits if not all the seeds of a nascent cucumber receive pollen during fertilization. This can happen if the weather is wet and cool, as the bees are less active and it is harder for them to navigate the wet blossoms. Later in the life of the plants, we had several flower bundles that never fruited, and other places where the tiny inch long fruit appeared to start but then simply withered right away, usually turning a yellow or reddish color and growing hard. This may also be a problem with fertilization, as this symptom did being with the heat of the summer, but I am not yet willing to rule out other potential problems. Essentially, I believe that all for these issues attacked the cucumber plants; low soil life and nutrients, an unseasonably wet spring followed by a hot dry summer, and the lack of crop rotation allowing the proliferation of cucumber disease and pests. Now, I can’t control the weather, but I think that if I had been conscious of the soil life and nutrients and not planted these guys in the same bed as last year, I could have had much better results with healthier plants facing the challenges of the weather. Facing increasing need for water and no sign that there would be any additional production from the pants, I decided to pull the plug and remove them entirely. I have removed all mulch from the bed and raked it through. A soil sample has been taken, and we will send it to Texas A&M for a soil analysis. We will work to fix the macro and micro nutrient composition of the soil, inoculate the soil with beneficial nematodes again, and we will not plant cucumbers here (or anything in the same family) for several years. We did do very well with Simpson Lettuce in the same bed over the winter, but I fear that we are simply not maintaining good soil health and have perpetuated some cucumber disease by planting in the same bed several years in a row. Hopefully I have learned my crop rotation lesson now, and with our improved tracking and data system, we should be able to insure that the bed is healthy and happy next season.